By Bill Hooper, at the Recreation Ground. Redruth’s Jeykll and Hyde season continued with this disappointing ill-disciplined home defeat to Barnes. 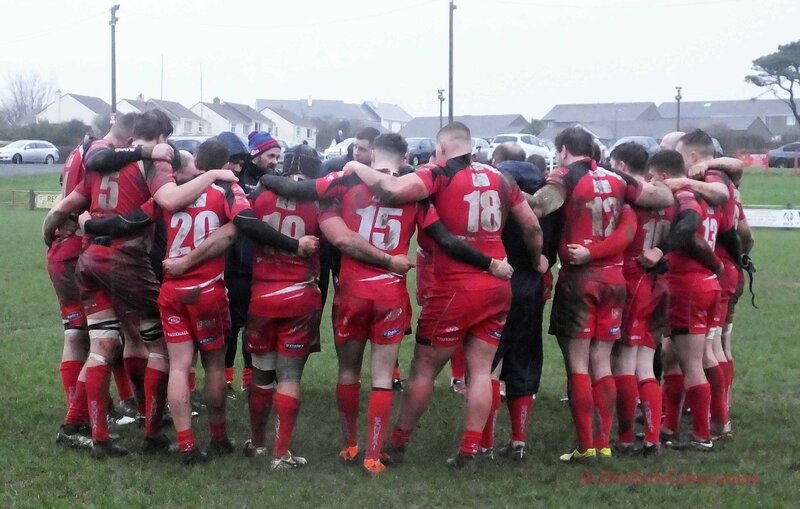 No question the Reds were the architects of their own downfall with a display that frustrated and clearly annoyed Director of Rugby Nigel Hambly as he spoke animatedly to his players in the post match huddle. There was a sombre atmosphere as the players remembered their former teammate James Huxtable, who tragically passed away a year ago. The players wore James’ final club Belsize Park socks in his memory, whilst the fly-half shirt worn by Richie Kevern had no number, with the actual 10 shirt hanging in the home dressing room on the peg that was James’ during his spell at the club. Barnes had first use of the slope, despite falling behind to a Redruth penalty, kicked by full-back Aaron Simmonds, were soon level when Josh Hammett replied in kind. Barnes pressure led to Redruth losing the influential player/coach Pale Nonu to the sin bin on the half-hour mark allowing the visitors to take full advantage scoring an unconverted try through skipper Jamie Collins. Redruth’s growing woes were compounded when they lost Simmonds to a red card. The full-back was adjudged to have made contact with his knee to an opposing player’s head. Barnes capitalised scoring a second try from another drive through prop Alistair Ryan with Hammett adding the extras for a useful 15-3 lead at the break. Redruth looked to claw back their deficit playing down the slope, however Barnes defended well leaving the Reds frustrated. They eventually got some reward as Dean Bonds got in amongst the forwards to score in the corner as Barnes lost lock Matt Steele to a yellow card as the pressure finally told. Scrum-half Jack Oulton looked to put Redruth on the front foot kicking to the corner from a penalty which led to a penalty-try to the home side and lifted the crowd. Redruth looked to have saved the game when centre Jack Simmons scored following good work from skipper Richard Brown and Nonu, but crucially the conversion was disallowed by the referee, despite both assistants raising their flags! With time running out back came Barnes piling on the pressure which eventully told as they scored a try through scrum-half Josh Davies to allow Hammett to kick what proved to be the winning conversion. Barnes then survived a late penalty attempt from Oulton that sailed wide and summed up Redruth’s day. Redruth: A Simmonds, T Notman, J Simmons, P Nonu, D Bonds, R Kevern, J Oulton; L Kivalu, M Gidlow, J Tompsett, T Prisk, L Hattam, J Clemson, S Stevens, B Howe. Replacements: R Brown, C Williams, L Barnes, J Tucker, N Webber. Redruth scores: Tries, Bonds, Penalty, Simmons, Pen, Simmonds. Barnes: T O’Toole, R Martey, D Holmes, N Van Buuren, T Pearce, J Hammett, J Davies; G Hunter, G Head, A Ryan, M Steele, J Collins, J Van der Poel, C Smyth, M Wakeling. Replacements: F McArthur, J Garrett, R Nimmo, F Avis, G Davies. Redruth man-of-the-match: Jack Oulton, another solid performance from the scrum-half on a difficult afternoon, kicked Redruth into good positions and gave his usual spiky performance.